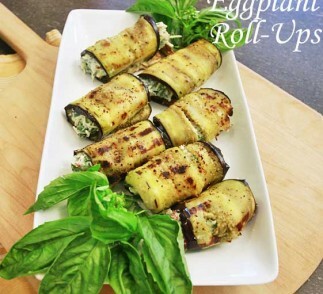 Grilled eggplant slices are rolled and stuffed with a savory Greek yogurt and cheese filling. Delicious and festive, they make a great spring/summer appetizer or side dish! In a medium bowl, combine the filling ingredients. Set bowl aside or chill in refrigerator until eggplant is ready. Thinly slice the eggplant in strips. Brush with olive oil and season with salt, pepper and grill seasoning on both sides. Using a grill pan over medium heat, cook the eggplant 2-3 minutes per side. Take off the grill, set on a platter and let cool slightly. Using a teaspoon, scoop the filling and place in the center of the eggplant. Roll one side of he eggplant until rolled up, filling will stay inside. Serve hot or at room temperature.